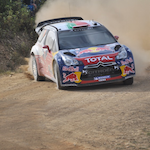 On 26 October, Sébastien Ogier was crowned for a second time after winning the Rally Catalunya. He is following the example of Sébastien Loeb, his predecessor nine-time world champion. 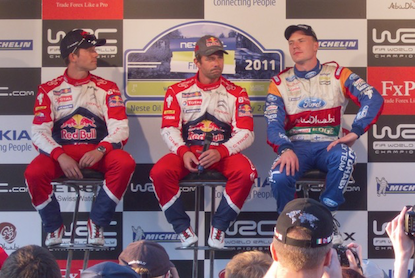 For the last 10 years, not one World Rally Championship title has escaped French rally drivers. A second successive world championship title is added to Sébastien Ogier’s list of prizes: the 30-year-old driver and his teammate Julien Ingrassia came top of the Spanish race, ahead of two Finns, Jari-Mari Latvala and Mikko Hirvonen. Ogier continues his reign over the World Rally Championship that he began last season and thus prolongs Sebastien Loeb’s reign over the sport (nine titles from 2004 to 2012). With the two Sébastiens, France is very lucky to have such amazing rally drivers; for ten years, the French flag has now been at the top of the WRC board. Hang in there Ogier! You have a few more years to go.